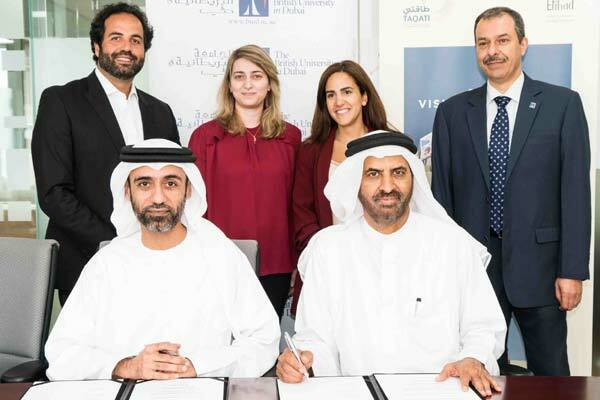 Taqati, the dedicated programme management office for the Dubai Demand Side Management (DSM) strategy, has entered into a partnership with the British University in Dubai (BUiD) for the Dubai Energy Efficiency Training Program as part of its mandate. Taqati has been set up under Etihad Energy Service Company (Etihad Esco). Etihad Esco CEO Ali Al Jassim signed the agreement with BUiD vice chancellor Prof Abdullah Al Shamsi during a ceremony organised at Etihad Esco’s headquarters. The training programme aims to build the right capabilities to achieve Dubai’s ambitious target of 30 per cent reduction in energy consumption by 2030; boost awareness and adoption of new technologies that promote energy efficiency; nurture a community of innovators and thought leaders to spearhead energy efficiency measures in Dubai; and to create value for the emirate by offering continuous opportunities for professional development. The programme combines an array of internationally and locally certified training programmes and modules to cater to the learning and development needs of various stakeholders in Dubai’s energy sector. Training tracks have also been created to support the industry in understanding the right skill sets that correspond to their job functions. Various programmes under the initiative include Certified Energy Manager (CEM); Certified Energy Auditor (CEA); Certified Measurement & Verification Professional (CMVP); Performance Contracting & Funding; Building Commissioning Professional as well as the Leed training suite and Well AP.